The clubrooms of the Radio and Electronics Association of Southern Tasmania are located on top of the Queen’s Domain in Hobart. Our clubhouse has a long and colourful history and has a historic connection with the exploration of Antarctica. This building was constructed by the Commonwealth Government in 1912 as one of a chain of coastal wireless stations to communicate with shipping. 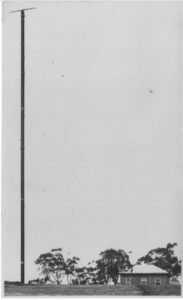 The original equipment, a 5kilowatt spark transmitter and crystal receiver were made by the Maritime Wireless Company, run by “the Wireless Priest”, Archibald Shaw. The 180 foot high mast was made of oregon baulks bolted together. Initially, all communication was by Morse code on 600metres (500KHz). It was first run by the Post Office with the callsign POH. Following an international conference the callsign was changed to VIH. Messages cost 6d per word plus 1d per word to forward to the Hobart Post Office: equivalent to about $10 per word today. 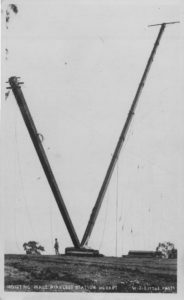 Completed 180foot mast and Domain building in 1912. The Hobart station was the second of the chain built and thus ready for use with the 1.5KW Telefunken stations erected by Mawson at Macquarie Island (MQI) and Adelie Land (MAL). Mawson’s station at Macquarie Island could easily communicate with Hobart. The Hobart newspaper, the Daily Post, regularly reported on the ship stations contacted each night and “the land station on Macquarie Island”. However Mawson’s station in Adelie Land was less successful, the very strong winds at Commonwealth Bay damaging the aerial mast and dry blowing snow generating static electricity which interfered with reception. In 1915, the operation of the coast stations was taken over by the Royal Australian Navy (RAN), this continued until 1922 when Amalgamated Wireless Australasia (AWA) was given the operation of the stations. By 1924, VIH was using a De Forest ultra-audion valve receiver. The spark transmitter remained in service until replaced in 1926 by a 2 KW valve transmitter, much to the relief of local broadcast station listeners who had had to suffer interference blotting out the daylight reception of the Melbourne Cup results from 3LO. 1926 Mercury article on the valve upgrade to the station with a picture. Undated picture of Wireless Station note the lack of trees and manicured gardens. A picture of the interior in 1947 is available here. After WWII, the station was run by the Overseas Telecommunication Commission (OTC) until it closed in 1992. The Wireless Institute of Australia, Tasmanian Division, Southern Branch took over the premises and REAST’s club call sign (VK7OTC) recalls this history. In recent years, the building has been shared with the Tasmanian Smallcraft Marine Radio Group who operate the Tas Maritime Radio marine station from the clubrooms. The Station – circa 1970s. The building is now heritage listed (THR # R2452). The coastal wireless station is of historic heritage significance because of its ability to demonstrate the development of wireless communication systems, including early Antarctic exploration. 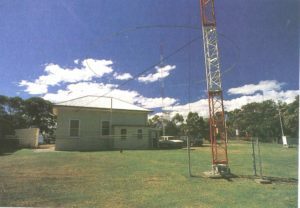 The Coastal Wireless Station is of historic heritage significance because of its ability to demonstrate the principal characteristics of an early twentieth century communications system building.